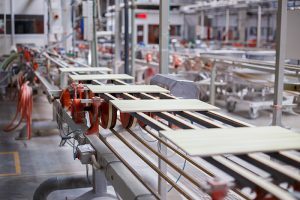 In the first part of my “Why Quantities Matters” series, I explained that larger quantities lead to improved manufacturing efficiencies which result in lower costs. We will continue to expand on this topic as it relates to quantities, but this week the focus is on availability and procurement. As you know, the construction process doesn’t simply begin the moment the yellow excavators and backhoes arrive on site. Before the jobsite trailers and the weekly construction meetings, engineers and design professionals have been busy behind the scenes, actively planning and forecasting. Whether the project is large, small, private, or public – a successful job starts with thoughtful planning and purposeful design. And one of the most important and critical parts to this process that should not be overlooked, is determining appropriate quantities early on. This is especially true when dealing with finish surfaces and accessories – and tile is no different. 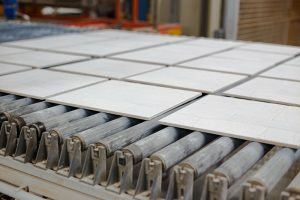 If your project has more than 5,000 SF of any one tile product, chances are, your tile distributor won’t be able to satisfy your order from stock. Unless you want a mismatch of differing sizes and shades, procuring a single lot in that quantity just isn’t going to happen. Therefore, the approach must be different. Larger projects are inherently unique, so the production needs must take a custom approach to match your job specific needs. As alluded to earlier, the larger the quantity on your purchase order, the less likely the tiles you’ll receive will be of the same dye lot or production run. Even on the off chance that the quantities are available, there will be a significant likelihood that the tiles will have multiple shades and varying calibrations. Not something you want in your 10,000 SF feature foyer. Knowing quantities early on is critical for success. Remember, larger quantity jobs won’t be in stock. Factor in the sequential nature of construction, and the ultra-fast pace in which it operates, hoping for your tile to be in stock when the project is ready, is not something that should be left to risk. So, how do we combat this all too familiar situation? It’s really quite simple. Provide accurate quantities early on – this allows for proactive program management, even during the design phase. Remember, your tile supplier should be more than an order processor or a logistics manager. At CMC, our personal level of accountability is what allows for us to truly optimize the manufacturing process, by leading the coordination channels with the factory, and by exploring every option that can improve production and the overall schedule. Through a consultative client focused process, we design a customized, purpose-built supply chain program that eliminates unnecessary costs, minimizes lead times and ensures material availability. Check back with me next time, as we will explore Part 3 on this topic!